Irrigation systems come in many different shapes and sizes. The one that is right for your Baltimore property depends on your needs among other factors. Below, we will describe the different types of irrigation and sprinkler systems and when you would need which one. It is important that you have a sprinkler system that works well so all of your lawn and garden gets watered. This will not only save you time, but money as well. Soaker Hoses – this is the type of irrigation system that most gardeners are familiar with. A soaker hose is used primarily to water dense plants. A soaker hose sweats out water along the length of it. Drip System – drip irrigation is the most efficient way to irrigate many different things. 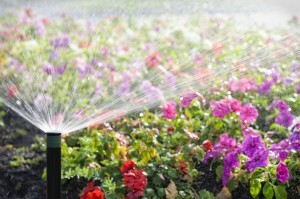 A drip system also uses less water than other types of irrigation systems. A drip system can be customized to meet each lawns needs. Traditional Automatic Spray System – this is a type of irrigation system that ha pop up spray heads that can be adjusted so every part of your lawn or garden gets watered. A disadvantage is that it can be less efficient than other types of irrigation systems because it waters the ground faster than the water can be absorbed. For more information about outdoor drainage systems in Baltimore, call Aqua-Bright today at 410-489-9009 or take a tour through our website. This entry was posted on Wednesday, February 19th, 2014	at 6:41 pm	. You can follow any responses to this entry through the RSS 2.0	feed. Both comments and pings are currently closed.